2Pcs Pillow Cases Covers Shell Couch Bed Sofa Print Dahlia Compass 18X18" 20X20"
Floral Cushion Cover Sofa Home Décor Pillow Case 12" 16" 18" 20" & 24"
2Pcs Neutral Grey Cushion Covers Pillows Shells Dahlia Florals Home Decor 20x20"
Contain: 2Pcs Cushion Covers/Shells, No Filler, No Pillow Insert. Gentle cycle only. No bleach. Tumble dry low. Do not iron. the actual size having no more than 5% difference is permitted because of hand cut work. 2Pcs Square Pillows Cover Cases Cushion Covers Shell Vintage Floral Decor 20X20"
2Pcs CaliTime Florals Gold Jacquard Cushion Cover Throw Pillow Cover Home 20X20"
Contain: 2Pcs Cushion Covers/Shells, No Filler, No Pillow Insert. Gentle cycle only. No bleach. Tumble dry low. Do not iron. Fabric content: 100% polyester. 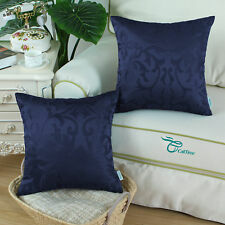 2Pcs Navy Blue Cushion Covers Cases Shells Couch Sofa Home Roses Floral 20"X20"
Design: Silky Poly Faux Silk Fabric, Smooth & Thin & Light Fabric, Matching Color Reverse, Soft Touch. Contain: 2Pcs Cushion Covers/Shells, No Filler, No Pillow Insert. Gentle cycle only. No bleach. Pack of 2 Pillow Case Cushion Cover Shell Couch Mandala Snowflake Floral 20X20"
2Pcs Grey Teal Cushion Covers Pillow Shells Dahlia Florals Home Car Decor 20x20"
Pack of 2 Grey Pillows Covers Cases for Couch Sofa Home Roses Florals 20"X20"
Design: Silky Poly Faux Silk Fabric, Smooth & Thin & Light Fabric, Matching Color Reverse, Soft Touch. Gentle cycle only. No bleach. Tumble dry low. Do not iron. the actual size having no more than 5% difference is permitted because of hand cut work. 2Pcs Coffee Pillows Shells Cushion Covers Florals Two Tone Contrast Sofa 20"X20"
2Pcs Pillows Covers Cushion Covers Florals Jacquard Reversible Home Decor 20X20"
Contain: 2Pcs Cushion Covers/Shells, No Filler, No Pillow Insert. Design: Reversible, invisible zipper closure in one side. Gentle cycle only. No bleach. Tumble dry low. Do not iron. Fabric content:Polyester, Heavy, Thick. 2Pcs Burgundy Cushion Covers Cases Shells Couch Sofa Home Roses Floral 20"X20"
Design: Silky Poly Faux Silk Fabric, Smooth & Thin & Light Fabric, Matching Color Reverse, Soft Touch. Contain: 2Pcs Cushion Covers/Shells, No Filler, No Pillow Insert. Size: 20" X 20" (50cm X 50cm). 2Pcs Grey Yellow Cushion Covers Pillow Shell Dahlia Floral Home Car Decor 20x20"
2Pcs Deep Purple Cushion Covers Case Shells Couch Sofa Home Roses Floral 20"X20"
Pillow Cases Covers Shell for Couch Bed Sofa Print Dahlia Compass 18X18" 20X20"
Pack of 2 Candy Pink Cushion Covers Cases Shells Sofa Home Roses Florals 20"X20"
CaliTime Square Throw Pillows Cases Cushion Covers Florals Shadow Bird 20 X 20"
Floral Digitally Printed Pillow Case Cushion Cover Sofa Home Décor 12"-24"
2Pcs Burgundy Florals Jacquard Pillows Shells Covers Home Sofa Car Decor 20"X20"
Contain: 2Pcs Cushion Covers/Shells, No Filler, No Pillow Insert. Gentle cycle only. No bleach. Tumble dry low. Do not iron. Fabric content: 100% polyester. Size: 20" X 20" (50cm X 50cm). 2Pcs Bright Yellow Cushion Covers Pillow Shells Dahlia Florals Home Decor 20x20"
Contain: 2Pcs Cushion Covers/Shells, No Filler, No Pillow Insert. Fabric content: Poly Fleece. the actual size having no more than 5% difference is permitted because of hand cut work. Set of 2 Cushion Covers Cases Shells Couch Sofa Home Roses Florals Gold 20"x20"
Contain: 2Pcs Cushion Covers/Shells, No Filler, No Pillow Insert. Gentle cycle only. No bleach. Tumble dry low. Do not iron. Design: Silky Poly Faux Silk Fabric, Smooth & Thin & Light Fabric, Matching Color Reverse, Soft Touch. Flower 3D Cushion Cover Sofa Décor Throw Pillow Case SZ 12"16"18"20"24"
2Pcs Pillow Cases Cover Manual Hand Painted Colorful Trellis Chain Print 20"X20"
2Pcs Navy Blue Cushion Covers Pillow Shells Dahlia Florals Home Car Decor 20x20"
Floral Printed Pillow Case Cushion Cover Sofa Decor Size 12"16"18"20"24"
2Pcs Black Cushion Covers Case Shells Couch Sofa Home Roses Floral Decor 20"X20"
Flower Digitally Printed Pillow Case Cushion Cover Sofa Home Décor 12"to24"
Floral Butterfly Printed Cushion Cover Sofa Home Décor Pillow Case 12",24"
Red Flower Printed Cushion Cover Sofa Decor Pillow Case Size 12"16"18"20"24"
Peacock Floral Printed Cushion Cover Sofa Home Décor Pillow Case 12",24"
Set of 2 Garnet Cushion Cover Cases Shells Couch Sofa Home Roses Florals 20"X20"